I seem to have a recurring disagreement with fellow Christians. I don’t like disagreements. I try to avoid them, but, when it comes to the persecuted church, I keep having them. The conversation typically goes something like this: We are engaged in talking about some current event related to Christian persecution. The brother or sister in Christ then says, “they have it so bad over there. It really costs them to be a Christian.” –Which of course is true. Then I usually say, well, we are all persecuted if we follow Christ. We share the same kind of persecution—even if it is not to the same degree. That line—we share the same kind of persecution—usually provokes an almost hostile response, and I am not sure why (feel free to explain below). Rather than attempting to probe deeply into the spiritual psyche of those who revile my position, I think I’d rather lay out 5 reasons it is important to understand persecution as something which impacts all Christians–including American Christians. Indeed, all who desire to live a godly life in Christ Jesus will be persecuted, while evil people and impostors will go on from bad to worse, deceiving and being deceived. Christians in the New Testament are promised persecution. Jesus explains the reason for this persecution in Matthew 5:10-12. Basically, the persecution happens because Christ is present with His people (“on account of me” in Matthew 5:11). Just as the world hated Christ then, the world will hate him (via his people) even now (see also John 15). Whether the persecution is imprisonment (as in Acts 5) or being falsely accused (Matthew 5) or being mocked (Acts 17) or being executed by the sword (Acts 12)—in each instance, there is Christian persecution—a hostile, retaliatory action against the presence of Christ. Both Jesus and the New Testament make this point clearly. Second, those who wish to make a distinction between torture and name-calling are correct in so doing with regard to the severity of the crime. Who could doubt that it is worse to be lacerated with an electrical cable than to be laughed at during a family meal? Nevertheless, as was just pointed out above, the difference is in degree of persecution–not in whether or not persecution was suffered. Many, hoping to maintain the distance between “real” persecution and the “light” afflictions we suffer in America, sadly end up injecting an artificial distance between Christians in America and Christians in the rest of the world. The priestly prayer of Jesus in John 17 works against such a bifurcation within the body of Christ. It is our Lord’s desire for us to be one—even as Father, Son, and Holy Spirit are one. In trying to maintain the distance between the suffering of American Christians and the suffering of brothers and sisters in Nigeria, for example, some leaders speak of persecution as though it is worthy of the name only if it is of a particularly fantastic variety: prison, torture, beatings, death. 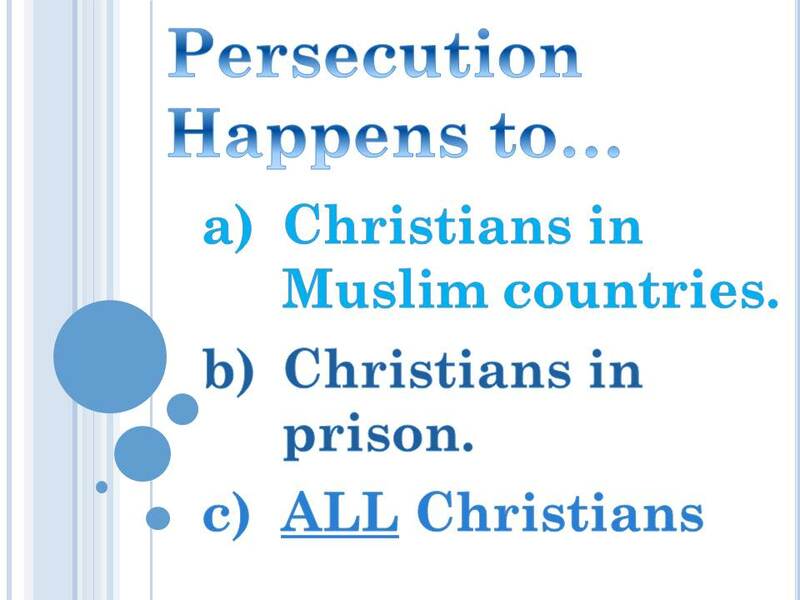 Persecution ends up being a pertinent category only for “those” Christians over “there” in other parts of the world. This, it seems to me, artificially divides the body of Christ. Indeed, we are commanded in Hebrews 13:3 to remember the persecuted as though we are in prison with them since we ourselves are one in body with them. The New Testament calls for us to close the gap in the body of Christ by identifying in united fashion with the persecuted. We can’t do that if we separate ourselves into “those over there” who suffer persecution and “us over here” who do not. That is an artificial, unbiblical distinction.